SEAN: It’s hard this week for me to pick between my perennial lost cause Hayate the Combat Butler and the final volume of Spirit Circle. I think I’ll go with the latter as Hayate will no doubt still be coming out ten years from now. MICHELLE: Seeing as how there’s not much else that calls out to me, my pick this week is volume seven of Lovesick Ellie. I was a little concerned about the direction the series was taking in the last volume, so here’s hoping that this next one offers some reassurance. KATE: There’s nothing on this week’s list that floats my boat, so I’m going to recommend a title that was released just a few days before Christmas: ABARA. It’s a beautiful, haunting, and strange manga that’s stayed with me longer than any of Tsutomu Nihei’s other series — and that’s saying something, considering Nihei has at least *two* series in which a talking bear is a significant character. ASH: ABARA is indeed an engaging manga and probably my favorite work by Nihei to be released in English so far. 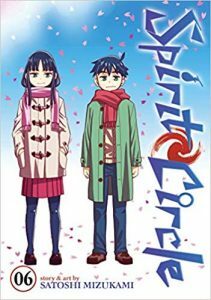 But this week I’m with Sean in picking the final volume of Spirit Circle. I’ve really been enjoying the series. MELINDA: There’s nothing that really draws me in this week, so I’m going to use my pick to boost the signal about something cool going on in another area of publishing right now, which is the Kidlit for Trans Rights auction ending tonight at midnight. Some of the prizes you can bid on are very writer-specific, like query or first pages critiques from agents, but there are also a slew of signed books and annotated copies from authors to bid on, and it could not be for a better cause. If you’re a fan of children’s, middle grade, or YA books, check it out!